I just finished a new blog post in my series "30 Years Ago in Guitar Player". 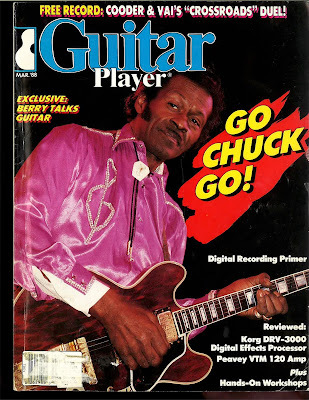 It features a fascinating cover feature on Chuck Berry, articles with Ry Cooder, Eldon Shamblin, jazzer Rory Stuart and bassist Emory Gordy and more. I bought that issue just for the Cooder/Vai insert. Other than that, this series kind of depresses me - since these "30 year ago" posts are from about a decade after I stopped buying GP every month, and I didn't save any of the 4 years' or so worth that I had. I actually still have some of those issues, but I'm in the "why didn't I take better care of them" dept. Who would have actually thought that magazines (and print media in general, and physical music media, and...) would have virtually begun to disappear from the face of the earth as a viable form of media.